Investors have rushed into the marijuana industry. But with no clear guidelines, it might not be a good long-term bet. 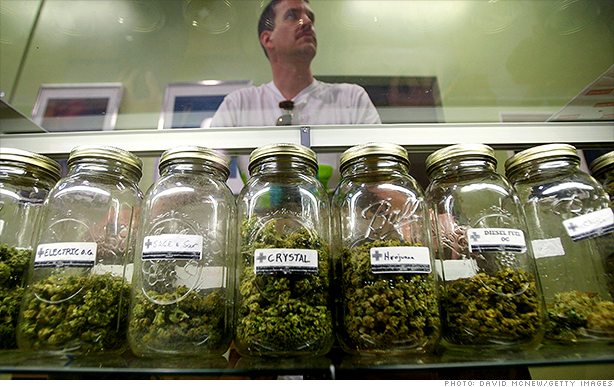 Weed is going mainstream, but Wall Street's hopes for the marijuana business may be too high. Several publicly traded pot companies, such as Medical Marijuana (MJNA) and Cannabis Sciences (CBIS), have beaten the market this year. But these stocks and many others in the industry are extremely volatile. Most of them are thinly traded penny stocks. One of them, GrowLife (PHOT), had trading halted for several days last month. Once the stock resumed trading, it has endured violent swings up and down on an almost daily basis. Marijuana business experts speaking on a panel at the Milken Institute's Global Conference in Los Angeles Wednesday said they were still hopeful about the industry's growth prospects. But they acknowledged that there is still a Wild West mentality pervading the business. "The demand is there," said Mike Zapolin, CEO of Zappy Incorporated, a diversified cannabis development company. But he added that there are no "brand leaders." That means that the industry is wide open "for anyone to come in." A lack of regulation may also be a concern for the industry. You read that right. More regulation might help the pot business. "There's no standardization and that's the problem," said Todd Denkin, president of DigiPath, a botanical laboratory company. "There's no regulation for the ingredients inside." Denkin estimated that 98% of laboratories only test for THC, the main psychoactive ingredient in marijuana, whereas his company tests for toxins such as mold, pesticides, and heavy metals. He also expressed concern that dispensaries don't do a good job of educating customers about what types of marijuana are best to treat various ailments. "There's no training for getting a job at a dispensary," Denkin asserted. While 21 states now have medical marijuana laws on the books, the substance is still illegal in the federal government's eyes. And it's therefore up to state and local governments to regulate, said Craig Ellins, CEO of GrowBOX Sciences, a firm that manufacturers a household marijuana cultivation system. "Have you ever been to a city council meeting?" Ellins quipped. "It's five people in front of you that you would not employ." Another issue with the marijuana industry is the lack of access to banking services. Dispensary owners can't deposit their money in federally-insured banks, since those profits are considered illegal, even if they were earned in a state that considers them lawful. The Obama administration has also recently issued some guidelines to banks about how to deal with customers in Colorado and Washington, where marijuana sales for recreational use are now legal. But Doug Praw, a Los Angeles lawyer who advises investors on the cannabis industry, said that some marijuana companies may choose to do business with state chartered banks that are not insured by the FDIC. As for where exactly to invest, the panelists urged caution. "Do your research, find out who crosses their t's and dots their i's," Denkin said. Still, Ellins likened investing in shares of public marijuana companies now to tech stocks. Many tech start-ups go belly up, but anyone who invested early on in companies like Microsoft (MFST) or Amazon (AMZN), for example, is obviously pretty happy. Praw added that a lot of private equity companies are getting into the marijuana infrastructure business, even if they're not investing directly in the green stuff. Software, agricultural equipment, pharmaceutical testing, and real estate for warehouses, dispensaries, and cooperatives are all attracting investor interest, Praw said. There's also Leafly, considered the Yelp of weed dispensaries. But even with public opinion about marijuana changing, the business is still incredibly risky. Investors probably shouldn't be looking to penny pot stocks to become the next Pfizer or Merck.